Here's how to grow rosemary at home, whether you want to grow it in a pot or in your garden. Rosemary is the most fabulous herb to keep and grow. It has lots of benefits both as a culinary and a medicinal herb and it's attractive too. In spring dramatic blue flower spikes emerge which early bees find irresistible. Rosemary is not easy to grow from seed. It is generally best to grow from cuttings or grow-on a bought plant. Here is simple guide for how to grow rosemary. Obtain your plant(s) from a reputable source. You want to start with a strong, disease-free plant. You can also grow your own rosemary plant direct from cuttings if you want to keep costs down - see below for details. You will need to be patient as it will be a couple of years or more before a cutting grows to a useful size. You can grow your rosemary in a planter or large pot or you can plant it out in the ground. It will require a fair bit of space and needs keeping in check with an annual prune to prevent it from sprawling untidily. Planting rosemary in a container is a good solution if your garden is too cold or damp; you can move the container indoors or into shelter to avoid the worst seasonal weather. Growing rosemary in a container is quite easy. Make sure that the container is deep enough to give the roots plenty of room. My pot-grown rosemary plant is in a 16 inch pot and is now in its third year. See below for where to plant rosemary and more on how to grow rosemary in a pot. Choose an open, sunny site to plant you rosemary bush. Rosemary is fairly hardy but it's a Mediterranean herb so it may need protection in fierce winter conditions. Try to offer it some shelter from the worst of the winter weather by placing it near a hedge or other shrubs. It's also a good idea to avoid known frost pockets. Ideally, choose a damp day to transplant your rosemary bush. If the soil is not damp, give it a good sousing with rain water to prepare the hole. Dig a hole which is at least half as wide again as the root ball and deep enough to easily accommodate all the roots without stress. Add a few handfuls of well rotted compost and mix it well into the loose soil at the bottom of the hole. Gently lower the plant into the hole and check that it has enough room for all the roots. If possible, spread the roots out a little to help them find their way into the soil. Water your plant copiously and back-fill the soil carefully around the roots. Tamp the soil down for a snug fit. Stake your plant with a small sturdy stake if the site is at all exposed. Winds can prevent the roots from becoming established in the first few weeks after transplanting if this is not done. Add a good mulch around the base of the plant to help feed the plant and to help keep the moisture in the soil for the plant. Well rotted compost is the simplest option but you can use other things such as bark chippings, leaf mold, or old newspapers. Even pebbles used as a mulch will help reduce evaporation in a dry climate. Rosemary can be grown successfully in a pot. It makes a great addition to a container garden, with its striking dark foliage and attractive scent and flowers. Make sure that the pot you choose is easily big enough to contain the root ball of the plant and more. Add some drainage crocks - broken pots or pebbles are ideal. Make a good mixture of potting compost and soil. Add some of this to the bottom of the pot and then lower the rosemary's roots into the pot, making sure that the stem ends up above soil level but not too high in the pot. In-fill the soil mixture carefully around the plant and tamp it down so that the roots are in good contact with the soil. Leave the top of the soil mix about one or two inches from the top of the pot. This gives plenty of room for watering. A pot grown plant needs watering adequately but allow the plant to nearly dry out between waterings. This is a Mediterranean herb which is used to dry, rocky conditions. As your rosemary plant grows you will need to upgrade to a bigger pot from time to time. Use the opportunity to renew the soil and compost mix. Be careful not to damage the rootlets when you tip the rosemary plant out of its pot. Water very well after planting rosemary in a new pot - just as you did to begin with your rosemary pot plant. Growing rosemary from seed is possible but I've not tried it yet. You can get French rosemary seed here. It is quite easy to start rosemary plants from cuttings in late summer or early autumn. Take a good number of cuttings from new growth shoots. Ideally, the shoots should be about 6 - 10 inches long i.e. not too tiny. Cut the cuttings from where the new shoot joins the older wood. Cut as cleanly as you can with a sharp knife. Strip off the lower leaves and pot the shoots into sand or sand and soil mix. Just push them firmly into the soil. You can plant them in pots, several to a pot, or just push them into the soil in a corner of the greenhouse or other sheltered spot. The soil needs to be reasonably sandy or free draining to discourage mold and other undesirable organisms. Water them well and cover with a plastic bag for about three weeks. Remove the bag within a few weeks of planting as otherwise mold may damage the shoots. After a few weeks new growth from the cut end of the shoot may be apparent but I prefer to leave them undisturbed all winter. You can now pot on the successful shoots into individual pots of compost and grow them on. A little hormone rooting powder can help with root formation but is by no means necessary. 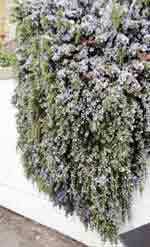 Rosemary needs pruning and the best time to do it is straight after flowering in early summer. Cut back any untidy growth and shape the shrub into an open chalice shape. Keep prunings for burning on an open fire - they smell wonderful. You can also use longer stems for skewering food for barbecuing. Alternatively, use clippings as a source of mulch for other plants. Rosemary has a reputation for helping as a companion plant to beans, carrots and cabbages. It is reputed to deter bugs. I haven't tried it yet so I cannot comment!